Manheim Township Alumni Association accepts nominations for the annual Distinguished Alumni Award from January 1 to March 1 of each year. Since 1997, MTAA has bestowed the Distinguished Alumni Award on graduates who have achieved noteworthy and outstanding accomplishments in their chosen fields, have served their communities, and will serve as role-models for students district-wide. Award winners address each year’s graduating class at commencement rehearsal and are honored with a reception following the event. View the list of past Distinguished Alumni Award recipients. 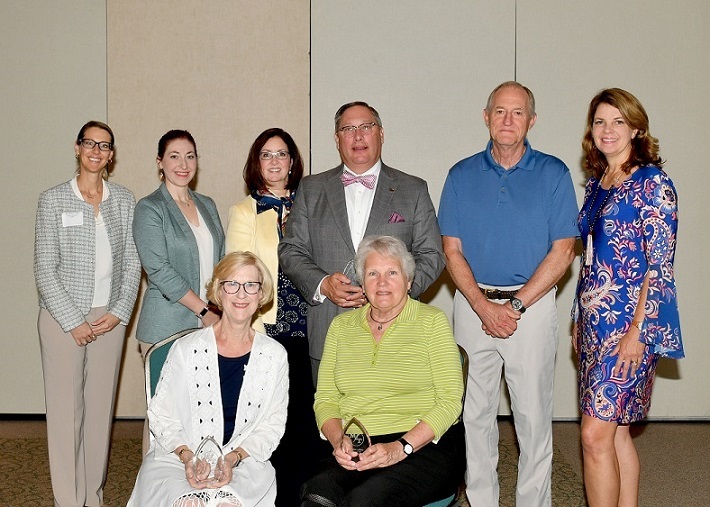 On June 6, 21018, the Manheim Township Alumni Association presented the Distinguished Alumni Award to R. Gene Eichelberger, class of 1958, Heather Lafferty, class of 1993, and P. Edward Lovelidge, class of 1978. The award winners addressed the 2018 graduating class during commencement rehearsal. Gene Eichelberger was unable to attend the event due to illness, so his sister, Alta Scheurich accepted the award on his behalf. Ed Lovelidge shared with the students a few tips for their future. He stated that family and friends should come first in their life and that service brings happiness. He accepted the award in honor of the entire class of 1978. Heather Lafferty shared a message for the students via a video about her experience at MTHS, her work with Habitat for Humaity, and her passion for working in the nonprofit sector. Heather's parents, Jim and Alice Lafferty accepted the award on her behalf. Following the presentation, a reception was held to honor the selected alumni. If you would like to make a contribution in honor of the Distinguished Alumni, please forward it to MTAA, 450A Candlewyck Road, Lancaster, PA 17601. Edward Lovelidge '58; Jim Lafferty; Sandra Orndorff, MTEF Board; (seated) Alta Scheurich '62; and Alice Lafferty. The Manheim Township Alumni Association is proud to announce the names of the 2017 Distinguished Alumni Award winners. Since 1997, Manheim Township has bestowed the Distinguished Alumni Award on graduates who have achieved noteworthy and outstanding accomplishments in their chosen fields, have served their communities, and act as role models for students in the Manheim Township School District. 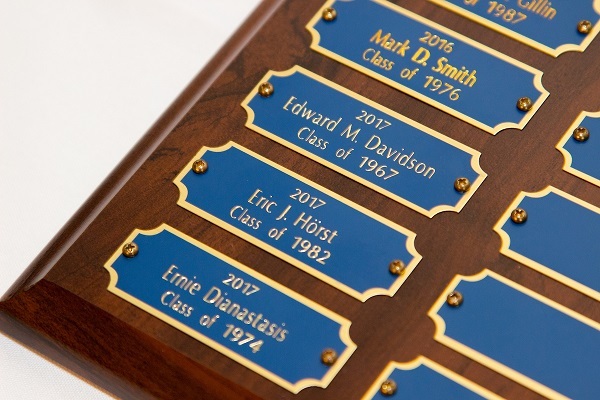 The following alumni were selected for the 2017 award: Edward M. Davidson, class of 1967, Ernie Dianastasis, class of 1974, and Eric J. Horst, class of 1982. The award winners were presented with their awards on June 6, 2017. 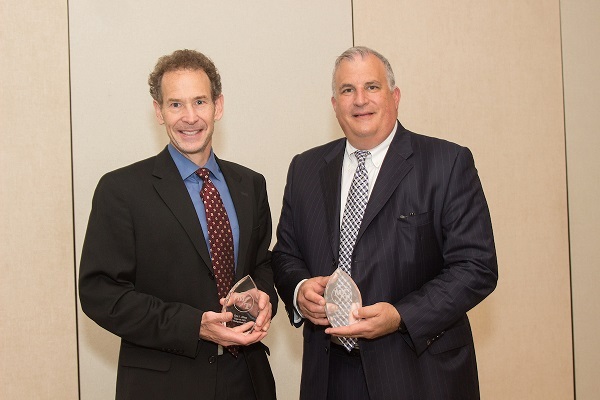 Members of the Manheim Township Educational Foundation Board of Directors presented the awards. Prior to the presentation, they each had the opportunity to share some stories and advice with the MTHS Class of 2017 graduating seniors during commencement rehearsal. If you would like to make a donation in honor of one of the candidates, please forward it to MTAA, 450A Candlewyck Road, Lancaster, PA 17601. Pictured in Photo: Eric J. Horst, '82 and Ernie Dianastasis, '74. Missing: Edward M. Davidson '67.